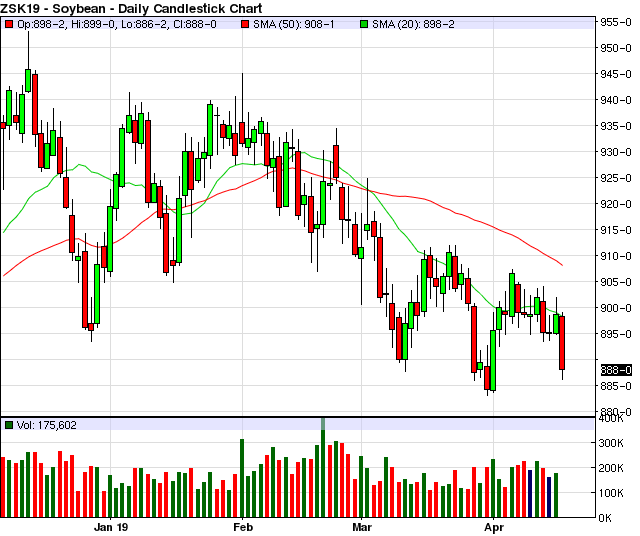 Soybeans were down over 10 cents on Tuesday, breaking back down toward recent lows. Funds were estimated to be aggressive sellers despite some mixed talk about a trade deal with China. The soybean chart now has an interesting set up. Where do beans go from here? From a news standpoint there were some mixed reports about the trade deal. On one hand there were rumors that a trade deal could be announced as soon as Thursday, supposedly to help offset the impact of the Mueller report. I will believe it when I see it, and I think the trade feels the same way. The (maybe) more important news was a little more obscure. Late Monday the US approved a US$500 million sale of F-16 fighter jet training and maintenance to Taiwan. I cannot imagine this sits well with China who has warned the US about interfering with Taiwan. News aside, much of the selling on Tuesday seemed to be technical in nature. In 7 of the last 9 trading sessions soybeans had tried to break out of the near-term downtrend channel and failed. This could have led to fund selling into the stops below last week's low. Tuesday's trade leaves a potential inverse head and shoulders formation on the chart. This could be a technical bottom if Tuesday's lows hold. However, if we have a decisive close below the March 29th (Quarterly Grain Stocks) low this could open the door to a new leg lower. This is an interesting time of year for grains to be under pressure. It is also not typical for the funds to take large short positions into planting the US crop. A spark could cause the funds to cover their record short positions, but will we get that spark? It will be interesting to see where we go from here, and I'll hold my breath for that trade deal on Thursday. Is the Spring Low in for Corn? Will Soybeans Ever Break the Range?